The 2017 cycling season is alive and kicking already and there have already been 4 UCI WorldTour* races this year and there are still 34 to come. 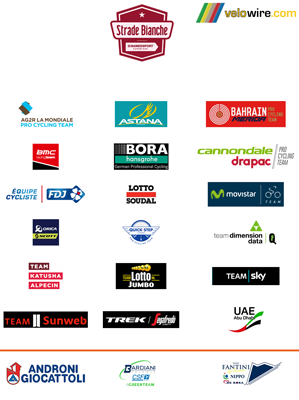 As you know, the UCI WorldTour races can invite, in addition to the 18 UCI WorldTeams, other continental pro teams, with a so called wildcard. And all those races of course do that to come up with a nice and dense peloton starting in all of the races. The French (organised by A.S.O.) and Italian races (organised by RCS Sport) have already announced which teams they invited this year and hereunder you'll find the list for each of them. * yes indeed, in addition to the Santos Tour Down Under, the Cadel Evans Great Ocean Road Race is now the second Australian race on this prestigious calendar, and the Abu Dhabi Tour the third one, despite the fact that for the Cadel Evans Great Ocean Road Race it's only the 3rd edition and despite the fact that the organisation probably doesn't have the level which we could expect from a race being on that calendar ... The Omloop Het Nieuwsblad being the fourth race. 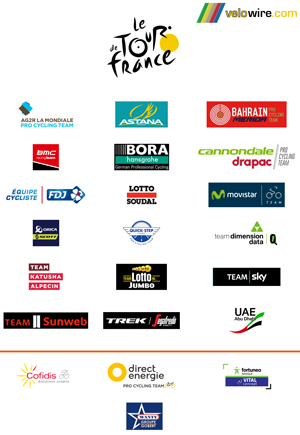 The teams which have been invited to the French UCI WorldTour races organised by A.S.O. 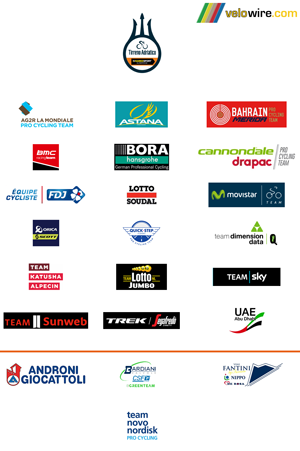 Amaury Sport Organisation has announced its teams selections for its UCI WorldTour races, more precisely Paris-Nice, Paris-Roubaix, the Critérium du Dauphiné and the Tour de France. 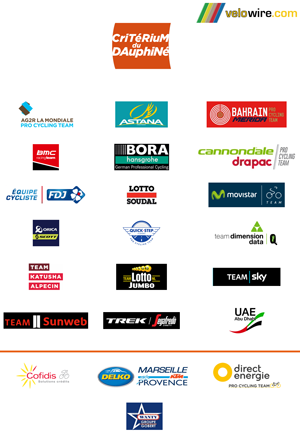 For the 75th edition of the race to the sun, Paris-Nice 2017, which will take place from 5 till 12 March 2017, 4 French teams have been invited: Cofidis, solutions crédits, Delko Marseille Provence KTM, Direct Energie and Fortuneo-Vital Concept. For the Hell of the North as Paris-Roubaix is nicknamed, and more precisely the 115th edition which will take place on 9 April 2017, Amaury Sport Organisation has invited 7 additional teams: 4 French teams, 2 Belgian teams and one Dutch team. The 69th edition of the Critérium du Dauphiné will take place from 4 till 11 June 2017 and will see 3 French teams - Cofidis, solutions crédits, Delko Marseille Provence KTM and Direct Energie - and one Belgian team, Wanty-Groupe Gobert, be present at the start in addition to the 18 UCI WorldTeams. The biggest race in the world is of course the Tour de France and for the Tour de France 2017 which will take place from the 1st till the 23rd of July 2017, A.S.O. 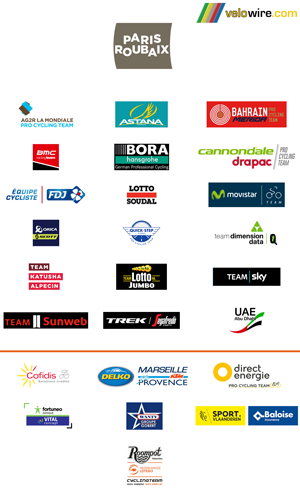 has invited the French teams Cofidis, solutions crédits and Direct Energie and the Belgian team Wanty-Groupe Gobert like in the Critérium du Dauphiné, but the 4th invitation will be for the French team Fortuneo-Vital Concept which is also invited in Paris-Nice but not in the Critérium du Dauphiné. RCS Sport has also announced its teams selections for its UCI WorldTour races, and more precisely Strade Bianche, Tirreno-Adriatico, Milano-Sanremo and the Giro d'Italia, knowing that the wildcards (invitations) for Il Lombardia will be announced later this season. For the races on the white roads, Strade Bianche 2017, 3 teams have been invited with a wildcard, in addition to the 18 UCI WorldTeams. This concerns 3 Italian teams: Androni Giocattoli, Bardiani CSF and Nippo-Vini Fantini. The Tirreno Adriatico, the race of the two seas, will take place the same week as Paris-Nice and the Italian race will see 3 Italian teams in addition to the UCI WorldTeams: Androni Giocattoli, Bardiani CSF and Nippo-Vini Fantini (the 3 same teams as for the Strade Bianche), and one American team, Team Novo Nordisk. 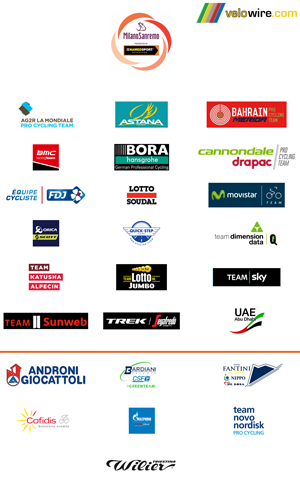 On the Saturday after Tirreno Adriatico and Paris-Nice, Milan-Sanremo will be on the programme of 18 UCI WorldTeams and no less than 7 teams which have been invited with a wildcard: 4 Italian teams, the usual ones: Androni Giocattoli, Bardiani CSF and Nippo-Vini Fantini but also Wilier Triestina, the French team Cofidis, solutions crédits, the Russian team Gazprom-Rusvelo and finally the Amercian Team Novo Nordisk. 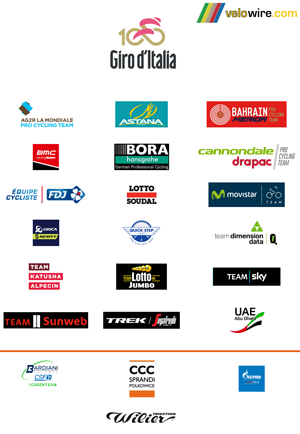 For its anniversary edition of the Giro d'Italia, the 100th edition of the Tour of Italy, 4 teams have been invited, 2 Italian teams - Bardiani CSF and Wilier Triestina, a Polish team - CCC Sprandi Polkowice - and a Russian team, Gazprom-Rusvelo. What is the result of four times three ?